Snowboarding and yoga couldn’t be more opposite, more yin and yang, yet they compliment each other in many ways. 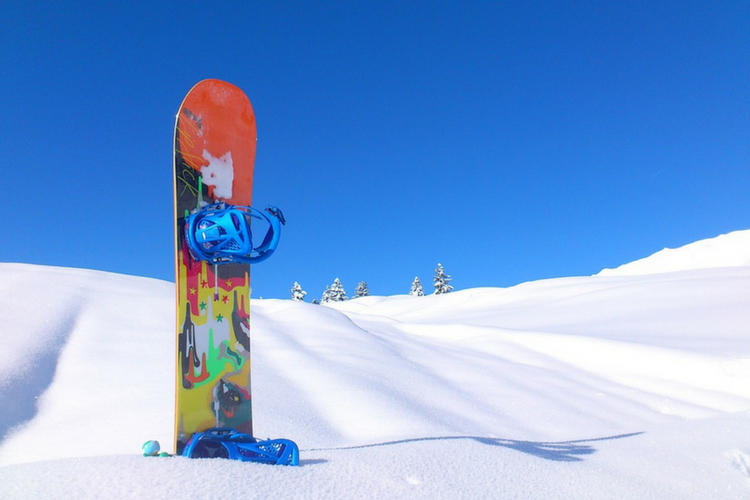 Snowboarding is fast and furious, the thrill seeking adrenaline sport that gets you up early in the morning for first lifts, wild with excitement and anticipation of how the day of powder hounding is going to turn out. The thrill of throwing yourself down the mountain, discovering new places to go, gliding through powder or dodging your way through a tree run, searching for that ultimate line is so exhilarating; occasionally remembering to look up and being overwhelmed by the raw, natural beauty and power of the mountains before you. There is something meditative within this experience, the mind clears, all worries fall away and you are left with just you and the mountains. It is an incredibly spiritual feeling that creates a sense of being present and the freedom to just be. 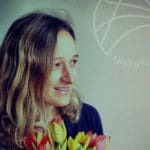 Yoga in comparison is calm and soothing, a meditative practice controlled through the breath and inner focus, yet it has a similar affect on the mind. Yoga allows the space to be present in body and mind, just as snowboarding does. 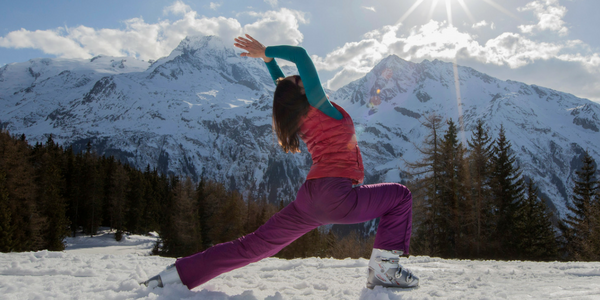 Yoga can benefit snowboarding in many ways, not only by helping to focus the mind and keep calm in difficult situations; it develops muscle strength, flexibility and balance. The movement and positions required in yoga can benefit boarders and help reduce the physical demands put on the body by the sport. Yoga helps to stretch out the muscles that boarding strengthens yet at the same time shortens. Quads, gluteal muscles and calves need lengthening due to the static positioning on the board. The strengthening of these muscle groups also causes a tightness to the lower back, hamstrings and hip flexors. 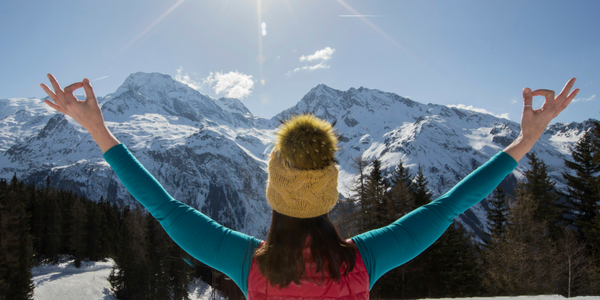 Mindfulness in yoga comes from arriving at each pose and holding it, focusing on the breath to ease the body into position and calm the mind, being present in each movement which is how we should deal with snowboarding. Bring the mindfulness of your yoga practice into every move you make on your board and you will lower the risk of injury. It is important to focus on equally strengthening and stretching all muscle groups in the legs, otherwise the knee joint ends up taking the strain, which can lead to serious injury around the knee. The quadriceps become overdeveloped when snowboarding and this in turn tightens and shortens the hamstrings. Inner thigh muscles can be shortened and tightened too, which can strain the knee joint by limiting range of motion. It is important to lengthen all four sides of the upper leg, hamstrings and quads, inner thigh (adductors) and outer thigh, to minimise the strain on surrounding joints. Snowboarding can be hard on the body because you are not completely symmetrical. It’s how we aim to be in snowboarding, but we stand side on to the mountain so rotation at the pelvis, all along the spine, predominantly at the lower back and also the neck is going to occur. Bring awareness of how to stand on the board at all times and when you find yourself over-rotating to bring your stance back into equilibrium by distributing your body weight correctly. When riding on piste, distribute more weight on your front leg and when riding powder more weight on the back. The pelvis is the largest bony structure in the body and it houses and protects our internal organs. It is also the base of the main energetic channel in the body called the Shushumna Nadi. The pelvis contains these important aspects of health and because of its location, when we learn to initiate movement from here we become naturally efficient and graceful. Hip flexor muscles are very important in maximising agility in snowboarding. However these muscles are rarely used nowadays due to our primarily sedentary way of life. We sit to eat, sleep, relax, work and drive; whereas our ancestors were outdoor hunters and gatherers, using their bodies continuously, giving strength and force to their muscles. This is why our largest muscles are around the hip area. By building more strength and flexibility in the hip area for boarding, it enables us to have a broader base of equilibrium and muscle foundation, which in turn improves the support to our upper body. Hip flexors also help with angulations of a turn, which means helping a boarder to make sharper, cleaner lines by being more in control of the board. Powerful and flexible hips encourage balance and good turning habits; otherwise boarders end up jerking their upper body to initiate a turn instead of using the lower body, which can lead to upper back pain from this awkward movement. Engaging the core muscles of the abdomen also enhances good turns on the slopes and alleviates pressure from the knees, protecting the joint from injury. Strengthening the core muscles helps to improve balance that is essential for snowboarding and also helps redirect weight bearing that often falls onto the knees. Awareness of your centre allows you to initiate movement, helps you turn more efficiently and distribute weight more evenly making each move less strenuous on the whole body. Core strength also offers support in falls and supports the spine in bending and twisting and stabilising. If the core isn’t engaged properly and tightness resonates in the hamstrings and hip flexors, then the lower back starts to be put under strain and can create an injury.